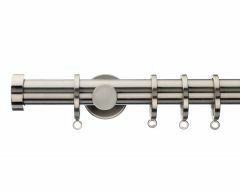 You'll be spoilt for choice when you view our wide selection of quality eyelet curtain poles for eyelet curtains. 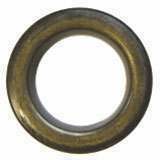 We recommend 28mm poles for curtains which have 40mm eyelets and 35mm poles for curtains with 50mm eyelets. 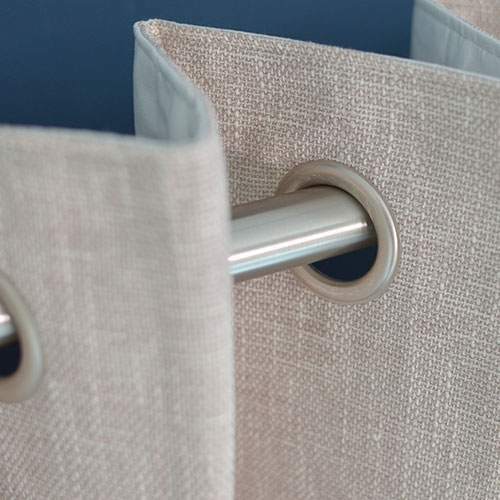 With a choice of wooden and metal eyelet curtain poles and everything you need to hang your eyelet curtains, our buyers guide will help you make the right choice. 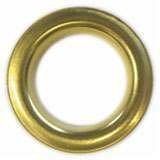 Pole diameter and bracket selection is important for eyelet curtains. 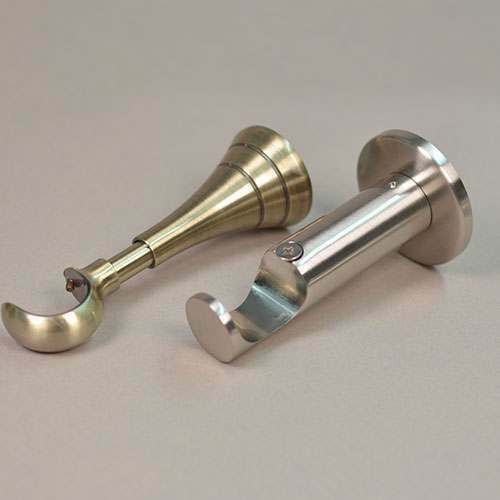 The Rolls Neo cup bracket and all the Swish curtain pole brackets are adjustable which helps bring your curtains closer to your wall to stop as much light coming into your room as possible but all our eyelet curtain poles have bracket options that work very well for eyelet curtains. Do I need a special pole for eyelet curtains? Generally we would say that eyelet curtains are best on a metal curtain pole as they perform well and it is often possible to match the colour of the metal eyelet to the colour finish of the pole. Wooden curtain poles can also be used, but with care. Over time the drawing open and closed of the metal eyelets rubbing against the top of the wooden pole may cause slight damage to the finish on the pole. 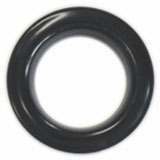 One way of limiting this damage is to use eyelet liners, which are discs of plastic which sit inside the eyelet. Which type of curtain pole is best for eyelet curtains? At Fendow we favour fixed length curtain poles which can be cut down to the size required, as curtains run so well on the smooth surface which this type of pole offers. It is our view that whilst extendable curtain poles are easy to fit, the disadvantage with their design is that the metal eyelets will not pull smoothly over the ridge where the inner and outer poles meet, which may result in the need for some manual adjustment each time the curtains are opened and closed, which is best avoided. Does bracket size matter when buying a curtain pole for eyelet curtains? Eyelet curtains fold evenly and stack back very neatly so they are an ideal choice when it is important to maximise the window span. The eyelets are normally spaced 10cm apart and wall brackets which extend at least 9cm out from the wall are needed to allow enough space for these folds. If you are having your curtains made to measure, some curtain makers prefer to adjust the spacing of the eyelets to create smaller folds and then shorter brackets may be ideal. If fixing to the ceiling, be sure to choose a curtain pole which has brackets with sufficient height to allow for the fabric above the metal eyelet to clear the ceiling. Eyelet curtains can be used with recess brackets if the brackets are positioned correctly on the side walls to allow for the folds and top of curtain clearance. 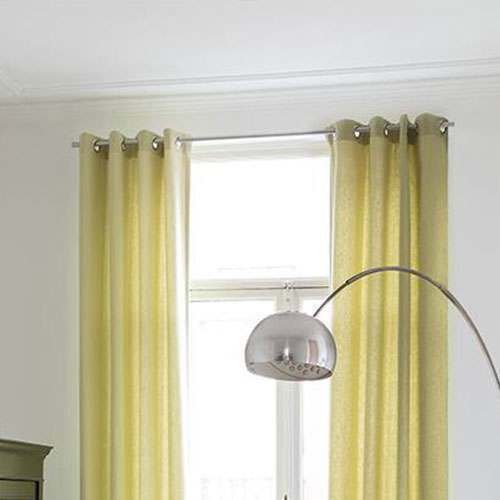 What is the best size of pole for eyelet curtains? 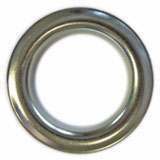 Metal eyelets come in a range of sizes from 23mm up to 66mm, with 40mm and 50mm eyelets being the most frequently used eyelet sizes in both ready made and made to measure curtains. The curtain pole you will need should be sufficiently smaller in diameter than the eyelet size, to enable the curtains to draw easily. 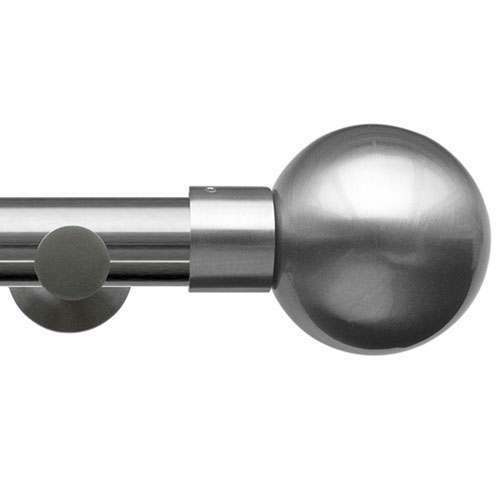 We have matched the most popular curtain pole eyelets to our eyelet curtain pole ranges to help you select the right pole to compliment your eyelet curtains.